At the formulation of the methodology in 2002, Prosci identified seven change concepts that make up the reality of change. These foundational concepts introduce the theories and perspectives of change and are central to the ultimate application of change management practices. One of them, “Resistance and Comfort,” recognizes that resistance is the natural reaction to change. Resistance has costs – it is not free. And, in order to avoid these costs and the potential risks to a project or change initiative, we must develop a planned and intentional approach to manage resistance to change. Resistance can also be a response to the change that is happening. The perceived value of the change being introduced can introduce resistance; we call that change-specific resistance. 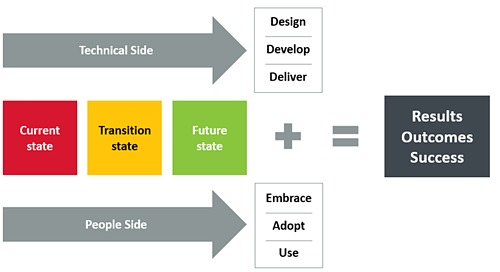 The visual shown below, the Prosci Unified Value Proposition, depicts change as a process with a technical-side workstream and a people-side workstream. These relate to the discipline of project management and change management, respectively. This model depicts a system of elements necessary to achieve the desired results or outcome – how we define success for a specific project or change initiative. From a resistance management perspective, we are taking the necessary steps to mitigate resistance throughout the process so individuals can make a successful transition to the future state – adoption and use is achieved – resulting in organizational benefits and project objectives being realized. Three avenues of resistance management will help mitigate the negative impact of resistance. Resistance prevention is about applying a structured and intentional approach to managing change. In other words, we apply the discipline of change management with resources trained to manage change. By doing so, we are taking the necessary steps to build awareness about why the change is happening, why it is happening now, and the risks if we don’t change. We engage senior leaders and middle managers to communicate the priority of the change relative to other projects and change initiatives. And, we address the number-one reason for resistance to change – lack of awareness. Potentially significant resistance can be avoided if effective change management is applied at the beginning of a project or change initiative. Prosci research participants indicated that almost half of the resistance encountered could have been prevented – a significant finding to address the costs and risks of resistance. Proactive resistance management is the anticipation and early identification of likely resistance, so it can be planned for, addressed or eliminated upfront. We should consider where resistance is likely to come from and the objections or concerns that drive resistance – the root causes – and then act on them ahead of time. After we have done both preventive and proactive resistance management, reactive resistance management comes into play when the project or change initiative “goes live” – when the change is real to impacted users. Reactive resistance management addresses resistance that could not have been anticipated or prevented or when resistance is enduring or persistent. One approach for putting these concepts to work and managing resistance to change is to conduct a series of ‘anticipating resistance’ discussions or workshops. This activity would be considered a component of proactive resistance management. It is recommended that you assess and examine resistance to change by impacted group, by organizational level, and due to organizational attributes. The way that various impacted groups will respond to change varies depending on the nature of the change and the degree of impact. Identifying potential resistance to change can be done through an ADKAR assessment to identify the barrier point and develop specific tactics to address the barrier (awareness, desire, knowledge, ability and reinforcement). Why individuals resist change varies at different levels of the organization. Executives resist change due to a disconnect with their strategy, financial objectives or compensation. Middle managers resist change due to lack of awareness, loss of power or control, and overload of current responsibilities. Employees resist change due to lack of awareness of why the change is happening, not understanding the WIIFM (what’s in it for me), comfort with the status quo, and fear of the unknown. With this information, we can develop special tactics to address resistance throughout the change management process. The Prosci Risk Assessment examines change characteristics and organizational attributes to define the “people risk” of a change. Reflecting on the scores for the organizational attributes – specifically looking at scores that are 4’s and 5’s – will highlight specific areas that require a special tactic to address potential resistance. Examples include change capacity, history with past changes, organizational reinforcement and change competencies. The output from these discussions or workshops will be targeted resistance management plans, with actionable steps and activities, to embed in the master change management strategy and plans. It is critical to build resistance management knowledge and skills for organizational “people managers.” Empowering senior leaders, middle managers and supervisors with the knowledge and skills to identify resistance, address root causes from both a personal and organizational perspective, and take the appropriate actions allows them to fulfill a critical role they share during change. An important note and prerequisite to formal resistance management training is that we need to recognize and understand that managers are employees first, and managers second. Prosci research participants identified mid-level managers as the most resistant group. This highlights how important it is that they go through their own ADKAR process before they can advocate for the change and manage resistance effectively. 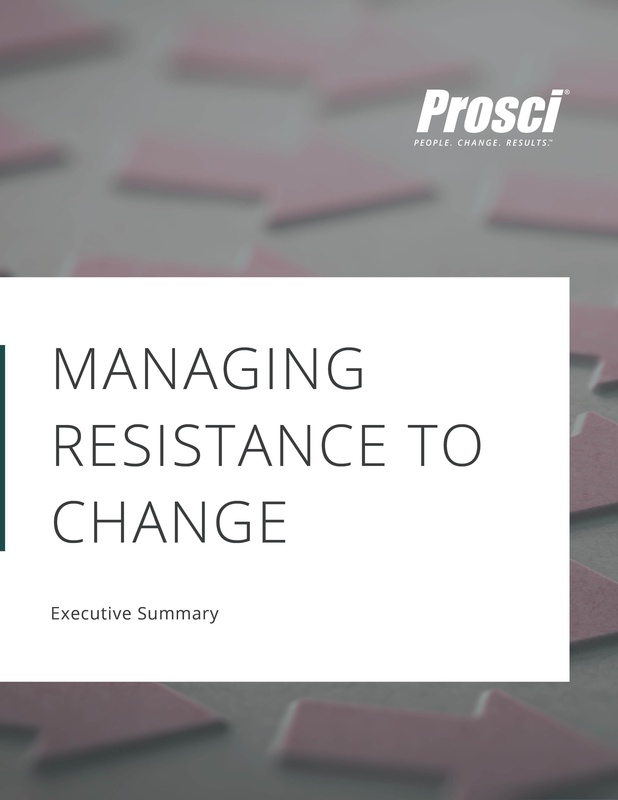 Developing a planned and intentional approach to manage resistance to change is built into the Prosci methodology. Proactive resistance management is done during the creation of the change management strategy focused on early identification and anticipated points of resistance so special tactics can be developed early in the change process. 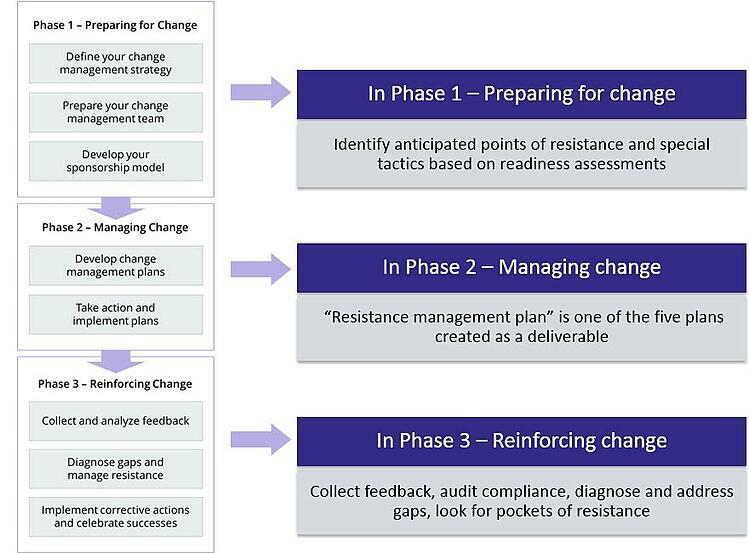 The Resistance Management Plan is one of the five plans in this phase focused on moving individuals through their own change process and addressing likely barriers to change. Specific elements of the Resistance Management Plan are integrated with the Sponsor Roadmap and Coaching Plan. Feedback is collected to understand adoption and compliance with new behaviors prescribed by the change. This will help diagnose gaps and address ongoing resistance. We must also look for pockets of resistance and address those conditions head on. Prosci leverages ten steps for managing resistance when desire is the ADKAR barrier point and personal coaching is required. Resistance is a natural reaction to change; but we have the power to control the duration, cost, and impact of resistance. How we support our employees through the change process and manage resistance to change minimizes the impact to employees, increases the effectiveness of the overall change management program, and opens the door to improved project outcomes and benefits realization. Resistance is a natural response to change and can be destructive; but resistance can also be constructive and improve change outcomes. This in-depth research study adds to existing research in the field by diving deeper into particular facets of resistance management. Download the executive summary for a sample of the insights and lessons learned.